Before we say good-bye to May, I thought I'd squeeze in one last page from this month's scrapping. I made this for the Reader's Design Challenge over at Aussie Scrap Source and guess what - I won! The topic was balance and symmetry, as you may well have already guessed from this layout. I used Basic Grey's What's Up Collection and a little Mister Huey white mist. I'm also linking this up over at the Purple Mailbox. She's got a little end-of-the-month feature, Layout Love Linky, that runs until the end of June. Maybe you have something to add there? Congratulations! Stunning photos. Love how you fit everything together with the title set in perfectly. 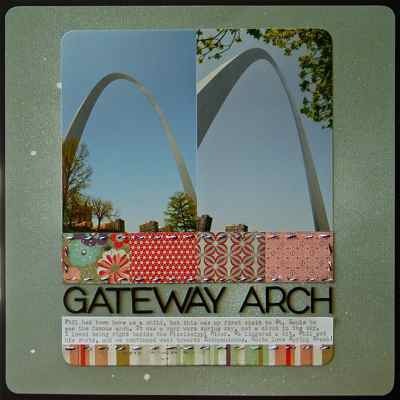 And I love the Arch. Perfect pics for symmetry :) Abie and I were just reminiscing about the arch tonight! Congrats on your won!! Yeah, congrats on the win. Great layout and photos! Congratulations. What a great layout. Nice job - I like the stitching. Congrats on the Get It Scrapped Design Team!! Cool! Like the double arch!